On October 3, the Supreme Court heard oral arguments in Gill v. Whitford, commonly known as the “Wisconsin Gerrymandering Case”. The Court in Gill will consider, amongst other things, a workable standard for analyzing the existence of a political gerrymander; such a standard they previously had found to be lacking in the Veith or LULAC cases. Specifically, the Court will consider a three-pronged test by which courts can evaluate whether a state’s political maps have been gerrymandered. Chief Justice Roberts’ and Justice Gorsuch’s criticisms of the standard notwithstanding, it is a workable standard which the Court ought to adopt. Underneath the Court’s considerations in Gill lies the way in which technology has, or rather could affect redistricting efforts moving forward. Depending on who you ask, technology is either the panacea in redistricting efforts with technology or it is a doomsday device which can be used to achieve whatever political end desired; the reality is more subdued. The best districts are compact, contiguous, and contain roughly equal population; one need merely take a cursory glance at current state districts to understand that describing current districts in this way would be incredibly generous. Redistricting technology truly ought to be viewed as being a tool to aid in redistricting efforts and combating vote dilution via gerrymandering. However, redistricting technology is not a silver bullet that can solve all problems. The technology still has major shortcomings; most notably that even if one were to advocate for completely outsourcing redistricting efforts to a fully automated method the technology simply cannot generate adequate maps at the necessary scale. It also should be noted that redistricting technology really is not effective at accurately determining if there is in fact a gerrymander occurring. McDonald and Altman note that while this would be a noble pursuit, the technology detects gerrymanders where one may not exist simply based upon the criteria the technology may be looking for. 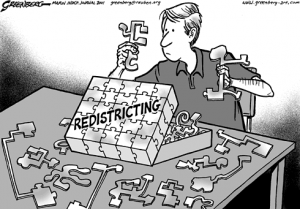 It may be that redistricting technology’s best use is in encouraging public participation in the redistricting process. It previously was the case that map drawing technology was cost prohibitive undertaking. However, with the introduction of open source programs such as District Builder this is no longer the case. In fact, by using a program like District Builder the public can directly participate in redistricting via map drawing. By engaging the public in this way and raising the profile of redistricting and drawing redistricting efforts out of the shadows we may arrive at a place where political gerrymanders may be harder to attain, though this may be wholly idealistic; thought maybe not because of the rise in the use of programs such as District Builder. However, the openness of the process and advances in the technology may provide a basis by which courts can effectively judge existing maps by the proposed three-pronged test. The Court in Gill is considering a workable standard by which it may evaluate political gerrymanders. As a part of that standard challenged maps would be subject to tests on the intent, effect, and justification for a challenged map chosen by the legislature. This standard would enable the courts to not only look at flaws in existing maps but compare them to maps that had also been generated as possible options while considering why those maps were rejected. It is here that the openness of the process enabled by redistricting technology may come into play. Redistricting technology has opened the door to the public to engage substantially in map drawing. Beyond that, the public has taken advantage of this opportunity. Should the Court adopt the e standard put forward by the Appellees in Gill, the public would be further empowered. Redistricting technology is not a silver bullet, nor should it be, but should the Court in Gill rule for the Appellees the impact these technologies may have will be unleashed, and for the better. See generally, Vieth v. Jubalier, 541 U.S. 267 (2004); LULAC v. Perry, 567 U.S. 966 (2012). Brief for Appellee at 9, Gill v. Whitford, 2017 U.S. S. Ct. Briefs LEXIS 3053 (2017) (No. 16-1161). Gill v. Whitford Oral Argument; OYEZ (October 3, 2017), https://www.oyez.org/cases/2017/16-1161, (Where Chief Justice Roberts refers to the Appellee’s standard as “sociological gobbledygook” and Justice Gorsuch compares the standard to his personal steak rub). Micah Altman & Michael McDonald, The Promise and Perils of Computers in Redistricting, 5 Duke J. Const. L. & Pub. Pol’Y 69 (2010). Aaron Sankin, The Tech Revolution that Could Fix America’s Broken Voting Districts, Daily Dot (Jan. 21, 2016), https://www.dailydot.com/layer8/redistricting-technology-obama-gerrymendering/. Brief for Appellees, supra note 2. Altman & McDonald supra note 4 at 91. United States Election Project, http://www.electproject.org/redistricting (Last visited Oct. 17, 2017). Micah Altman & Michael McDonald, Technology for Public Participation in Redistricting, Chap. 12, 247, 250, (2011), http://openscholar.mit.edu/sites/default/files/dept/files/altman2012-technology_for_public_participation_in_redistricting.pdf.